Iraq's parliament failed to reach a quorum on Thursday for a vote on declaring a nationwide state of emergency as Sunni insurgents advanced on Baghdad. Most of those boycotting parliament were from Iraq's Sunni and Kurdish factions, who oppose giving extraordinary powers to Shia Prime Minister Nuri al-Maliki - Reuters. ISIL have largely handed over control of Mosul to local tribes with some former Baathist army officers in a lead role. The Kurdish areas of the city remain under Kurdish control and are peaceful. ISIL and Kurdish forces have no interest in fighting each other. Predominantly Shia Muslim Iran will combat the "violence and terrorism" of Sunni armed groups who have launched an anti-government offensive in neighbouring Iraq, President Hassan Rouhani has warned. "This is an extremist, terrorist group that is acting savagely," Rouhani said live on state television. The president did not elaborate on what steps Iran would take to help thwart a bid by ISIL fighters to push towards Baghdad after seizing several cities and towns to the north. But he said he would head to a meeting of Iran's Supreme National Security Council immediately after his speech. With thousands of Arab and foreign fighters and a commander with designs on the leadership of al-Qaeda, the Islamic State of Iraq and the Levant has become the gravest threat to the region. Click here to read more about the armed group. The UN Security Council is unanimously supporting Iraq's government and people in their fight against terrorism and urging a national dialogue including all political and religious groups. But the council took no action after discussing the crisis sparked by the capture of two key cities by ISIL and hearing a closed briefing from the top UN envoy in Iraq, Nickolay Mladenov, on Thursday. Russia's UN Ambassador Vitaly Churkin, the current council president, told reporters afterward that members "strongly condemned all terrorist and extremist activities" and urged support to address the humanitarian crisis. Churkin said the root causes lie in the failure to rebuild Iraq and its armed forces before US troops departed. "As far as we are concerned we believe that the mission was not accomplished," he said. The White House says Vice President Joe Biden has told Iraqi Prime Minister Nouri al-Maliki that the United States is prepared to intensify and accelerate support for Iraq's security in the face of advances by fighters. The White House said Biden called Maliki Thursday morning. The call came as the Obama administration was beginning to consider the possibility of drone missions in Iraq. Officials said Obama was not contemplating putting troops on the ground in Iraq. The White House said Biden expressed solidarity with Iraq. Biden told Maliki the US assistance would help, quote, "confront the urgent and growing threat" posed by ISIL. Biden told Maliki that it was important that all of Iraq's communities be unified to defeat the ISIL. The New York Times has published a map detailing the cities in Iraq and Syria which are controlled by the Islamic State in Iraq and the Levant. View it here. The economic knock-on of what's happening is being felt. Reuters reports that global oil prices have jumped to a nine-month high. "The fear is that will cause a threat to Iraqi oil exports. If this conflict knocked out Iraq as an exporter, that would have significant impact on prices." - Christopher Bellew, trader. 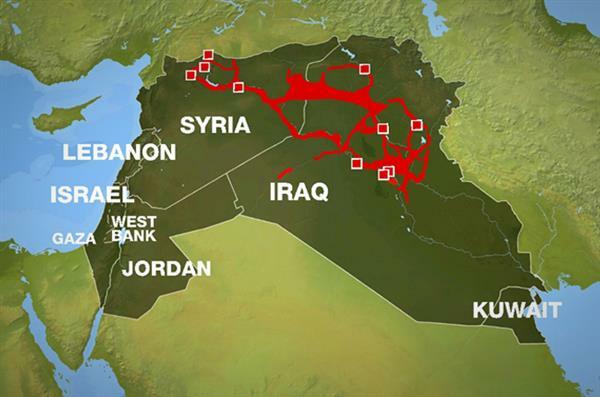 ISIL is spreading its influence across northern Syria and northern Iraq. The area marked in red on the map below shows where fighters are currently operating, including cities in Iraq and Syria. The group has outgrown al-Qaeda as it seeks to establish a new caliphate, based on the historical map of the old Islamic empire, which includes most of the countries in the Middle East. Reuters is reporting that Iraqi army helicopters fired rockets on one of the largest mosques in the city of Tikrit, citing local officials and witnesses. It was unclear if there were any casualties in the strikes. It is the same collapse that happened in the ranks of the Iraqi armed forces when American forces entered Iraq ... [they] took off military uniforms and put on civilian clothes and went to their houses, leaving weapons and equipment [behind]. ISIL is coordinating with the Naqshbandiya Order and some extremist Islamist factions and Baath leaders from the former army. Iraq's senior-most Shia cleric has called on Iraqis to defend themselves against Sunni fighters advancing toward Baghdad. 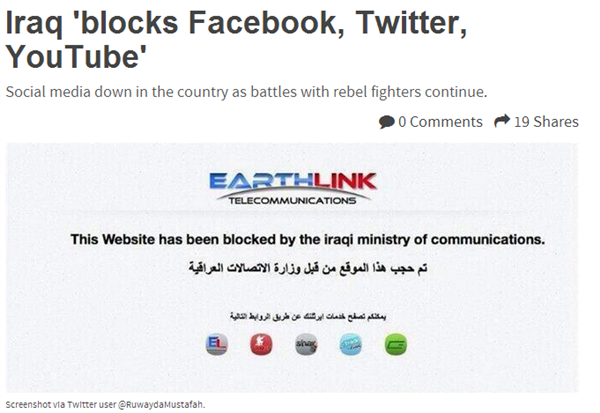 The Iraqi government has reportedly blocked Facebook, Twitter and YouTube for users in the country. The Stream looks at why this was done as battles with rebel fighters continue. US Treasury Secretary Jack Lew will discuss counterterrorism financing during his visit to the Middle East, including the funding network of ISIL. Lew will meet officials in the United Arab Emirates, Saudi Arabia, Israel and Germany next week, where he will also discuss issues of tax evasion and economic growth. "The recent events in the Middle East do nothing but underscore the importance [of terrorist financing], and so certainly that will be a prime issue that the secretary will be discussing, our joint efforts to undermine any financial networks that support terrorist groups," a senior Treasury official told reporters ahead of Lew's trip. Treasury officials said Saudi Arabia and the UAE see "eye to eye" with the US on the importance of stopping ISIL's activities. Influential Sunni group, The Association of Muslim Scholars have issued a statement saying the rebels are allowed to march on Baghdad and effect regime change but they must leave holy cities like Najaf and Karbala alone. Saudi-owned Al Arabiya TV reports that the Iraqi government has threatened to close the Baghdad office of the channel and ban correspondents of both Al Arabiya and its sister channel, Al Hadath, from reporting in the country. Reuters breaking news of a suicide blast in Baghdad. At least nine people dead and 20 injured by an attacker wearing a suicide vest, the agency says, citing police sources. 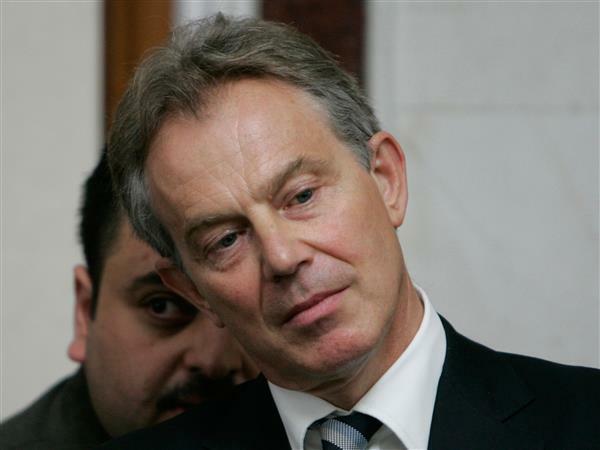 Former British Prime Minister Tony Blair has provoked, to put it politely, raised eyebrows on social media after saying the 2003 invasion of Iraq is not to blame for the current conflict. He made the claim in an essay in which he also said things would be worse in Iraq now if it hadn't been for the US-led action. You can read the full text here. Even though ISIL's advance and capture of Mosul was met with surprise from Iraqi and US officials, the gains was the result of of a strategy that was years in the making, writes Tim Arango. Kareem Fahim and Ben Hubbard of The New York Times. Al Jazeera's Hoda Abdel-Hamid reports from Khazer, in northern Iraq, where she looks into the plight of more than 500,000 people who fled the violence sparked by the rebellion. An Al Jazeera source is Ninevah province says heavy clashes are ongoing between Sunni rebels and Iraqi forces along with local militias in Tal Afar, a mainly Turkmen town. The rebels appear to be in control of about 90 percent of the town, causing thousands to flee. It's estimated that 50,000 have left. 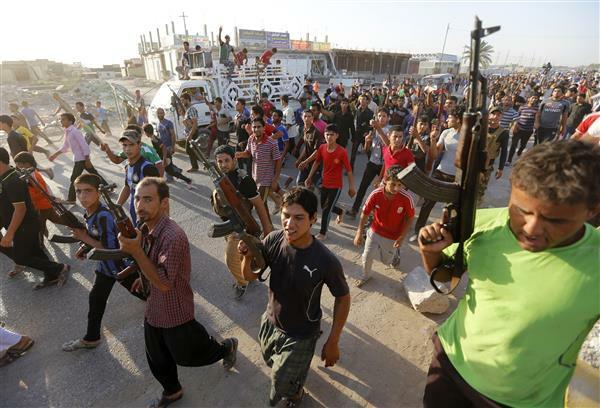 The fleeing Shias are expected to head west and the Sunnis to Mosul and possibly the Kurdish region. The death toll is expected to be high, with losses on both sides as well as civilians. Images that appear to show men being executed have been posted on a Twitter account said to belong to the ISIL. A caption on one of the pictures suggests the men are Shias, who are being punished for fighting Sunnis. The Twitter account was suspended hours after the images were posted. A senior US official tells Reuters that the United States is considering talking to Iran about Iraq. The Wall Street Journal earlier reported that such dialogue is expected to begin in the coming week. The mayor and residents of a northern Iraqi town close to the Syrian border say Sunni fighters have captured the town of Tal Afar. 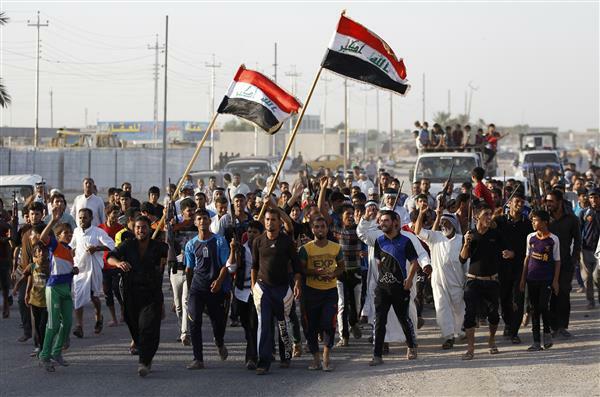 Mayor Abdulal Abdoul told The Associated Press that his town, located 420km northwest of Baghdad, with a population of some 200,000 people, mostly ethnic Shia and Sunni Turkmen, was taken just before dawn on Monday. The fall of Tal Afar comes a week after militants of the Islamic State of Iraq and the Levant captured Iraq's second-largest city, Mosul, and Saddam Hussein's hometown of Tikrit in a lightening offensive. 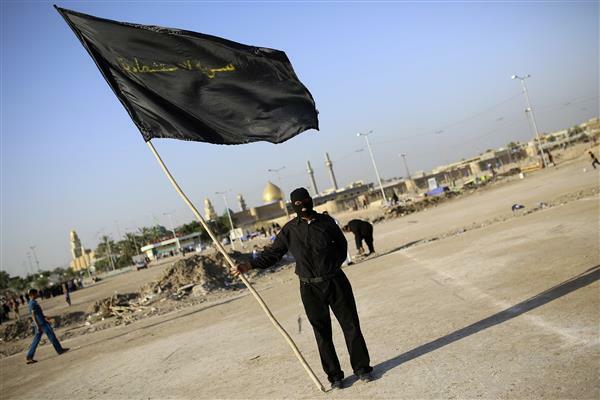 The US is preparing to launch direct talks with Iran on how to halt a Sunni insurgency that has seized a swathe of Iraq. According to The Wall Street Journal, the dialogue between the longime foes is set to begin next week. The White House, while declining to comment on the Journal's report, has not denied it. Deputy Secretary of State William Burns, who has led back-channel negotiations with Iran, has traveled to Vienna, where he will join Under Secretary for Political Affairs Wendy Sherman, the State Department has said. On Saturday, Iran's President Hassan Rouhani made a surprise announcement that Tehran would consider cooperating with Washington to fight Sunni fighters in Iraq. The UN chief has said the reports of scores of captured Iraqi soldiers being massacred is "deeply disturbing" and those responsible for it must be brought to justice. Secretary-General Ban Ki-moon said he welcomed the statement on the need for Iraqi unity made by Grand Ayatollah Sayed Ali Al-Sistani, who he said "represents a deeply influential voice of wisdom and reason." Fighters who overran cities and towns in Iraq last week have posted photos online that appear to show their gunmen massacring scores of captured Iraqi soldiers. 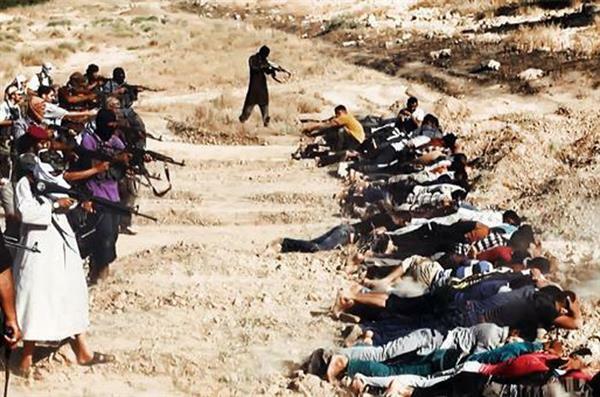 Pictures posted online purport to show scores of captured government soldiers shot dead by ISIL fighters. Qatar's foreign minister has blamed the "narrow" Shia sectarianism of Iraqi Prime Minister Nouri al-Maliki's government for the lightning offensive made by Sunni rebels that now threaten to dismember Iraq. Khaled al-Attiyah told Al Jazeera "negative factors building up over a period of years" had contributed to the uprising. "(Baghdad has been) pursuing policies based on narrow factional interests, adopting marginalization and exclusion, ignoring peaceful sit-ins, dispersing them by force, using violence against them and describing opponents as terrorists," said Attiyah. 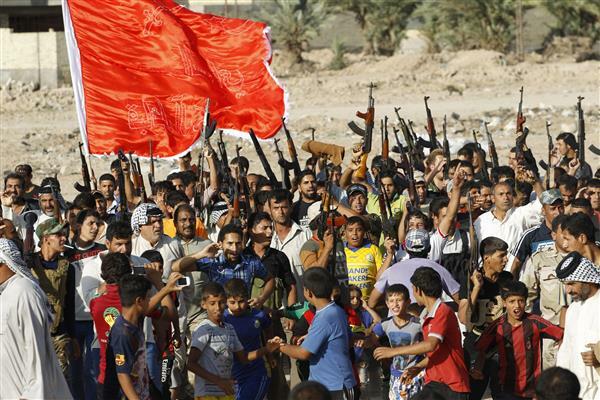 Rebels have overrun a large chunk of northern and north-central Iraq, despite a government counter-offensive. NATO Secretary-General Anders Fogh Rasmussen has called for the immediate release of Turkish diplomatic and security staff held by rebels in the northern Iraqi city of Mosul. Fighters from the Islamic State in Iraq and the Levant (ISIL) kidnapped 49 Turks, including special forces soldiers, diplomats and children, from the Turkish consulate on Wednesday as they overran Mosul. "We follow the dangerous developments in Iraq with great concern. I condemn the unacceptable attack on the consulate general in Mosul," Rasmussen said during a visit to Ankara, standing beside Turkish Foreign Minister Ahmet Davutoglu. "We want to see all of the Turkish hostages released and we want to see them safe," he said. Prime Minister Tayyip Erdogan has said the hostages are unharmed and that all efforts are being made to secure their release, as well as a second group of 31 Turkish truck drivers also captured by ISIL last week. James Bays, our diplomatic editor, reported that the UN is preparing to pull out some of its staff from Baghdad. At least 58 staff members have been sent to Jordan. Staff situated in the north of the country will be relocated to Erbil. The UN says that it is taking no chances and has made the decision to pull back their staff. In August 2003, a bomb attack on the UN headquarters in Baghdad killed 17 people including the then UN envoy chief. Three US officials have told the Associated Press news agency that the White House was considering sending a contingent of special forces soldiers to Iraq. Their limited mission which has not yet been approved would focus on training and advising beleaguered Iraqi troops, many of whom have fled their posts across the nation's north and west as Sunni rebels advanced against them. One US official said it could be up to 100 special forces soldiers, and could be authorised only as a advising and training mission. The White House would not confirm that special operations forces were under consideration, but spokeswoman Caitlin Hayden said that while Obama would not send troops back into combat, "He has asked his national security team to prepare a range of other options that could help support Iraqi security forces." According to another US official, the troops would fall under the authority of the US ambassador in Baghdad and would not be authorised to engage in combat. Their mission would be "non-operational training" of both regular and counterterrorism units, which the military has in the past interpreted to mean training on military bases, the official said. The three US officials all spoke on condition of anonymity because they were not authorised to publicly discuss the plans by name. Al Jazeera's Imran Khan reporting from Baghdad has reported clashes breaking out in Mosul between Sunni rebels and fighters from the Islamic State in Iraq and the Levant (ISIL). There are key ideological differences between the two groups, with Sunni rebels calling for regime change, whilst fighters from ISIL wanting to re-establish an Islamic State." BP has the oil company's operations in Iraq were so far unaffected by violence that has gripped much of the country. The company's chief executive, Bob Dudley, told the Reuters news agency at an energy conference in Moscow on Tuesday "we are just very vigilant in Iraq. Non-essential production people have left but operations continue." Asked if he was concerned about the Iraqi government's control over the country, Dudley said: "The people we are dealing with appear to be very much in control of the oil communications that we have." Dudley said BP's assets were a "long way from the troubles" in the south of the country, near Basra. Iraqi police say at least 44 detainees died as Sunni rebels attacked a police station northeast of Baghdad and fought with pro-government Shia militiamen defending the building. According to the officers, the station came under attack in Diyala province on Monday night. 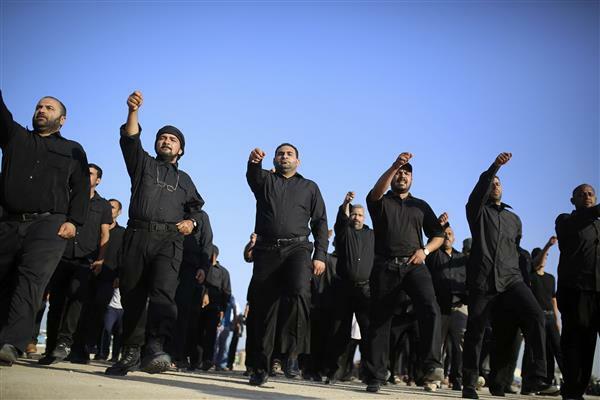 The attackers tried to free the detainees, before Shia militiamen killed the prisoners at close range. A morgue official in the provincial capital of Baqouba says many had bullet wounds to the head and chest. Iraq's military says 52 detainees were killed when the attackers shelled the station with mortar rounds. Al Jazeera's Imran Khan reporting from Baghdad says their is a renewed offensive by Shia militias in Baquba following the killing of dozens of Sunnis at a prison in Baquba. #Iraq . prison killings in Baquba. Government blame ISIL. 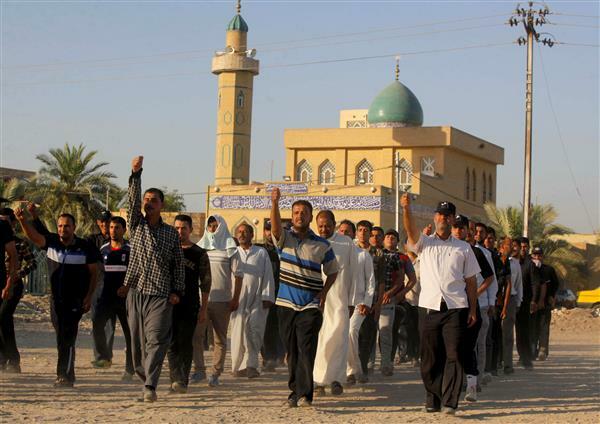 Kirkuk's Turkmen vow to take up arms if the city is not returned to Iraqi central government. Between 250 and 300 workers trapped in Iraq's largest oil refinery at Baiji have been freed during a brief truce in fighting. According to one of the released workers, the fighting between the Iraqi military and Sunni rebels for control of the strategic facility stopped allowing them to leave. The workers were escorted out according to an arrangement brokered by local sheiks for the employees to be taken out on buses, the released worker said. There had been 15,800 workers at the refinery and 100 foreign experts, most of whom had left by Tuesday when the plant was shut down by the government in anticipation of the attack. Iran's Supreme Ayatollah warns of "war in Muslim world"
A Twitter account believed to be run by the office of Iran's Supreme Leader Ayatollah Ali Khamenei has accused Sunni rebels of wanting to start a war in the Muslim world. A message posted in English on the account @khamenei_ir said such people wanted to foment distrust between Sunni and Shia Muslims, a goal they shared with "arrogant" powers, normally an Iranian codeword for the United States and its Western and Israeli allies. The message said: "Muslims should be aware of Takfiris and arrogant's common goal to create a war in Muslim world - both Shias and Sunnis should be vigilant." Takfiri's are Sunnis who proclaim followers of other sects of Islam to be infidels and therefore legitimate targets in war. Turkish Prime Minister Recep Tayyip Erdogan has warned US airstrikes in Iraq could lead to a high number of civilian deaths. "There are ISIL elements which are mixed in with the people. Such an operation could result in a serious number of deaths among civilians," he said.